as far as I know and remember..
Hi groupb - my question ( to continue this thread) is related to the ultra widebody demonstrator car, and it's origins? This car has been the inspiration for my build, in terms of body style, and i would like to know as much about it as i can - if anyone has inpt or knowledge I would be most grateful?? During my build we found that the wheel arches, specifically the line above the wheel, could not be cut any higher than they have been (shown in photograph below), as going any higher would necessarily result in structural changes to the strut towers and major body surgery. So - please can anyone help me track down the origins and perhaps current status of the ultra widebody demonstrator?? There are a few guys on the U.S. forums who seem to have a good knowledge of the wide-body demonstrator. I remember reading a while back that the reason this car looks so different to the factory built cars is because TRD USA didn't actually do the body work on this car themselves, they got a third party body shop that wasn't affiliated with Toyota or TRD to fit the kit. They suggested that it looked so different because in actual fact it was fitted badly i.e. not to the exact specification set out by TRD in Japan. I'm not sure if they did fit it badly or if they just went with their own interpretation on the kit, either way there were a good few Toyota purists annoyed by the fact that it wasn't the same as the factory built cars. Have you got any links to their threads? 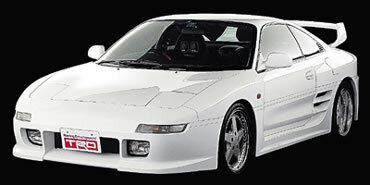 I don't have any direct links to the threads but if you try mr2oc.com or mr2.com and search for trd2000gt or widebody, you should come across some of threads. » 97 Murray wide body WITH PICs!